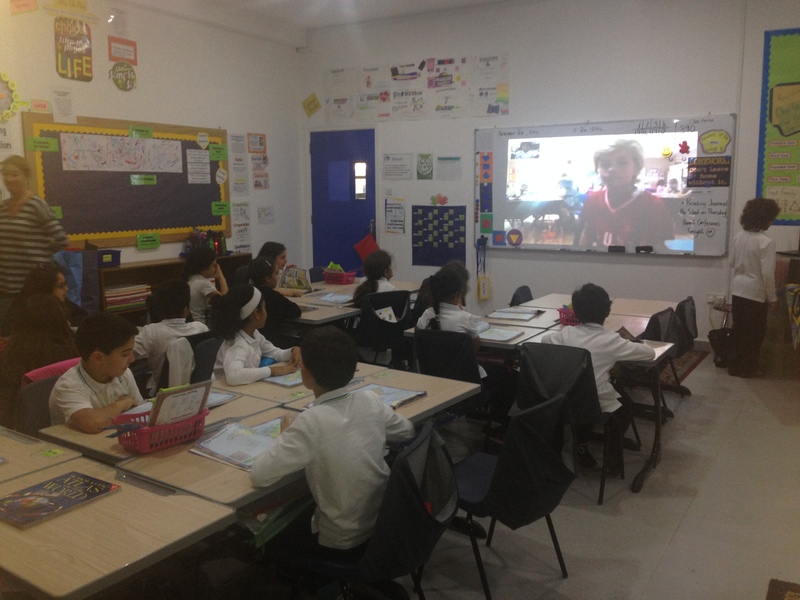 Today I participated in my first Mystery Skype. Awhile ago Alex was searching on Twitter for a class to Skype with. I contacted our 2nd & 3rd grade teachers and Andria was interested (love our COETAILers at AIS!). It took some logistical planning, but we made it work today! It was awesome. You had to be there to feel & hear the energy of the students. I loved being a part of it. As I’ve mentioned before, this kind of thing is what makes me love teaching & education. Both groups of students were excited before they even started. They eagerly created Yes/No questions that would help them figure out where the other class was. As their questions were answered and they gathered information they had to quickly adjust their questions based on their knowledge. They were excited about inquiry without even really knowing it. Our students had Atlas books. They started with the world page (no countries labeled). Once they found out that the other class was in Africa they turned to the world page with countries labeled. As they asked questions about where in Africa, Andria & I helped them use their hands to cover up where we knew they weren’t (North, South, West). When they narrowed it down to the Horn, we showed them the page with only those countries. I wish I would have been taking video when one of our students asked if they were in Ethiopia and the response was yes – the entire class cheered. The only cheer bigger may have been when the other class figured out that we are in Kuwait! Both classes figured it out a lot faster than I thought they would which gave us time at the end to ask open-ended questions about the countries. I think our students’ favorite question was about the type of animals in Ethiopia. They were shocked that there are SO many exotic animals in the wild. I’ll have to share my pictures from Learning 2 with our students so they can see the ICS campus. Our principal visited the room right after we ended and was bummed to miss it. But the excitement of the students was still evident and they were able to relive their experience by telling him. Hopefully we can have more opportunities like this for our students in the near future. Our principal would like to share these kind of things with parents so that they are excited for global connections and technology in the classroom. I’d also like to experiment with giving the students access to Maps on their iPads while they are Skyping.